You are currently browsing the tag archive for the ‘internet summit’ tag. 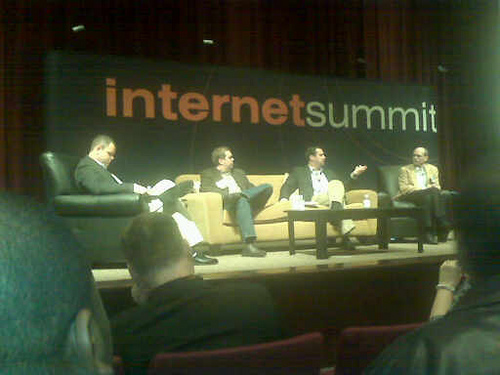 I asked a question of the Social Media: Engage panel at Internet Summit ’09 about 30 minutes ago and since that moment I’ve been thinking about online anonymity. People seem to hate it. When I blogged about the upside and relevance of anonymous comments as they relate to news stories, some people balked. Jason Falls said at Social Media Business Forum last month that he wishes newspaper sites would stop allowing anonymous comments altogether. I get that. I know the drama that ensues when people hide behind the cloak of anonymity. Heck, I live it as part of my job and I don’t always like it. But I still maintain that there is a place for it. You shouldn’t always have to be who you are just to communicate across the web, whether you’re on a social site or otherwise.And not everyone has awful intentions. So, I am going to take this to the extreme. If anonymity is no longer needed in society, let’s just get rid of the Witness Protection Program. Let the people who snitch on the mafia boss and turn in the mass murderer come forward publicly and deal with the consequences that may come their way because they decided to speak up. It’s all about transparency and openness right? That’s what everyone is saying. Be who you are. Show your face. Is this a fair comparison? Maybe not, but I think you can better see what I mean by bringing it to that level. The statement I made during my question of the panelists was that people are trying very hard to separate their personal lives from their professional lives in the social space, and even though that is probably impossible, they shouldn’t have to share their identity with everyone who visits your site just to interact with your content. That is how I feel about it. Alex Withers, head of Digital Media at the US Golf Association Association agreed. He discussed other options for registration on their site that do not reuire revealing your true self, as did Jennifer Sargent, CEO and Co-Founder of Hitfix. Withers had stated earlier that you should not create your own database of anonymous people, particularly when you can use Facebook Connect, something they didn’t do when placing a live chat window next to a live video stream of the U.S. Open. He went on to say that the content in that chat was not something they wanted on the site so they killed it. That was what they had to do. I’m sure it was ugly. But maybe it would have been better if it were moderated. I know, I know you need resources to do that and not everyone wants to hire people to do that…. I also know this is a topic that many people disagree with me on, but we can’t agree on everything. Forcing people to share themselves with your audience may keep them away. So let’s keep that in mind. Perhaps the strategy to focus on if you take this route is engaging lurkers, because I think you’ll have many of them. May as well figure out how to keep them. 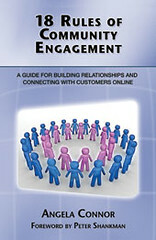 I’m attending Internet Summit ’09 tomorrow and plan to live-tweet and live blog, sharing what I find most interesting. At this point, these are the sessions I will attend, unless I change my mind at the last minute. If you’re interested in these sessions, follow me on twitter. I’m @communitygirl. You can also check my blog for updates and I may post over on SiliconAngle. Panelists: Andy Beal of Marketing Pilgrim; Brad Hill, Director of Weblogs; Rick Klau, Business Product Manager, Blogger/Google and Tim Schigel of ShareThis. Panelists: Seth Sternberg of Meebo; Doug Miller of Expedia; Ricci Wolman of The Body Shop; Matt Van Horn of Digg; Jermaine McPeek of the Phoenix Suns; Eric bBsco, formerly of AOL and Wayne Sutton of OurHashtag.